We’d love your help. Let us know what’s wrong with this preview of Culture War? 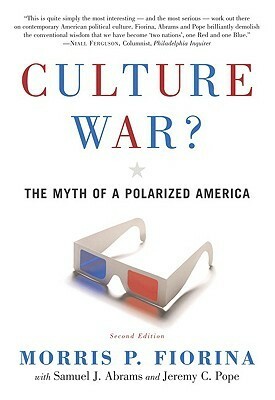 The Myth of a Polarized America by Morris P. Fiorina. To ask other readers questions about Culture War? The Myth of a Polarized America, please sign up. Incredibly boring: at one point the author recites the data tables that he has printed on the page. The other problem with this book is his hypothesis sets out to prove something we already know is true: media outlets sensationalize small contrasts to get headlines and attract viewers. Duh. The book would have been more interesting if his slant would have tried to blame the audience for continuing to click on nonsense, rather than the media who is only providing them with what they desire. Interesting analysis, but imperfect and now quite outdated. "Even if citizen attitudes on most issues are not highly polarized, has the way such attitudes translate into votes changed? That is, even if Americans are not deeply divided on specific issues, could it be that their views translate into votes in new ways that somehow magnify the differences that exist?" Morris Fiorina's Culture War pushes back on the idea that America is an intensly divided political state composed of blue states where liberals dominate and red states where conservatives dominate. Instead, he parses data on a variety of issues to attempt to demonstrate that most Americans still belong in the middle of the political spectrum, and the views of "red" and "blue" America are not truly that divergent. The books makes some good arguments, but in the end, I have to say that it didn't fu Morris Fiorina's Culture War pushes back on the idea that America is an intensly divided political state composed of blue states where liberals dominate and red states where conservatives dominate. Instead, he parses data on a variety of issues to attempt to demonstrate that most Americans still belong in the middle of the political spectrum, and the views of "red" and "blue" America are not truly that divergent. The books makes some good arguments, but in the end, I have to say that it didn't fully convince me. It may be true that many Americans still view themselves as moderates, but these Americans tend to be the ones who are least politically active, and in some cases their moderation just reflects their desire to adopt socially acceptable positions without having to know anything about politics, e.g., "both sides need to compromise." Moreover, Fiorina marshals many statistics to boost his argument, but I found myself questioning some of his methodology. His arrangment of seven point scales to reflect positions on controversial issues seemed designed to put such extreme positions at the opposing ends that there was virtually no way that many individuals would adopt them in a survey. Those individuals would be forced more toward the center of the scale, and Fiorina could then argue that they aren't so far apart politically, even though the positions they expouse may still be very opposed to each other. I thought this true especially in the chapters on guns and abortion, exactly the issues where you might expect the most disagreement. The “culture war” rhetoric recently popularized by some in the media polarizes and stereotypes Americans. Blue states are snobs. Red states are unsophisticated working class stiffs. But is such polarization real, or is it the figment of “politicos” in the media who have found a catchy sound bite? Media and the politic elite appear to find such divides useful to their purposes, i.e., to be able to play up to their base. Americans are divided in real ways across issues of abortion, gun control, an The “culture war” rhetoric recently popularized by some in the media polarizes and stereotypes Americans. Blue states are snobs. Red states are unsophisticated working class stiffs. But is such polarization real, or is it the figment of “politicos” in the media who have found a catchy sound bite? Media and the politic elite appear to find such divides useful to their purposes, i.e., to be able to play up to their base. Americans are divided in real ways across issues of abortion, gun control, and governmental control over their day to day lives. However, how much this divide actually results in “two Nations” is debatable. Fiorina (2005) provides somewhat of an answer to that question. It is that there is no real culture-divide and Fiorina hammers this point with survey data. Red and Blue states are not divided at all, but are centrists in orientation. However, when the survey data is examined America appears to be more right of center than smack down the middle centrists. For example, both Red and Blue States believe at equal levels that immigration should decrease, favor school vouchers, and view the moral climate as much worse than previously. Both hold socially progressive ideas of equality for women, oppose racial discrimination, and tolerance of others moral views. The divide comes in terms of gun control and opposition to legalization of abortion- and perhaps it is these issues that color our opinion of the "culture divide." It may be that there are deep divides in terms of these two issues in Red and Blue states, but on multiple core issues there is agreement in the conservative direction by the American Electorate. Red states versus blue states. We have all heard of the great divide in the United States for so long that it has become something close to "received wisdom." This thin little book, authored by the well-respected Morris Fiorina (with the assistance of Samuel Abrams and Jeremy Pope), questions this widely held view of a culture war raging in the United States. Fiorina, for those readers who are familiar with his academic research, is a skilled researcher, well schooled in statistics. It is to his Red states versus blue states. We have all heard of the great divide in the United States for so long that it has become something close to "received wisdom." This thin little book, authored by the well-respected Morris Fiorina (with the assistance of Samuel Abrams and Jeremy Pope), questions this widely held view of a culture war raging in the United States. Fiorina, for those readers who are familiar with his academic research, is a skilled researcher, well schooled in statistics. It is to his credit that he presents evidence in a way that is accessible to lay readers (his technical publications would not be so easily understandable to nonacademic readers). In short, he believes that the idea of a great culture war is dead wrong. As he says in Chapter 1: ". . .the sentiments expressed. . .[by:] scholars, journalists, and politicos range from simple exaggeration to sheer nonsense." Chapter 2 suggests strongly that the differences between citizens in red and blue states is not so great as advocates of the culture war say. While there is greater polarization between leaders of the Republicans and Democrats across the country, this same polarization is not nearly so manifest among the bulk of the American people. Indeed, the United States, in his view, remains a centrist, moderate country politically. I read this in the early 2000s in college and recall that even then I found the arguments less than persuasive. Having reread this book in the age of a stonewalling do-nothing Congress, gun-toting anti-government lunatics, and the rise of Drumpf, I am even less convinced than ever that this country isn't deeply, possibly fatally, polarized. It would be interesting to read a new edition, with new research, to see if Fiorina still holds to his thesis in light of 2016's grim reality. Fiorina's thesis is that political parties, not citizens, are increasingly polarized. He discusses how the two major political parties have moved to the left and right and provides arguments on what this all means for democracy. The updated version includes the 2008 election and how it does or does not fit into his thesis. Interesting and very well researched analysis of the polarization (or lack thereof) of the American electorate. I would be interested to see how some of the ideas have changed or how the data might be different if it reflected elections more recent than 2004 as well as the increased importance of social media in determining partisanship. reading the third edition, though... Goodreads doesn't seem to have it! Hmmm... hard to say whether or not I liked this book. I agree with Fiorina that the "Culture War" is overemphasized, but I dislike his solutions. Disappointing -- Fiorina seems content to debunk the crude red-state/blue-state with an endless array of statistics, never actually putting forward a more sophisticated analysis. I bailed after a hundred pages or so. Fiorina postulates and interesting theory regarding the political activity of Americans, and how americans are truly not as polarized as the media makes us out to be. This is a quick and interesting read. Very informative for the first few chapters however after that the author just keeps trying to prove his point,which becomes very tedious. Definitely altered some opinions about American polarization. An updated version would be nice, because a lot has changed in the political climate since 2004/2008. This was a great read, lots of data from all sorts of sources, and the answer is not what you might think it is! A MUST READ!! Seriously. Even if you don't subscribe to mainstream political ideologies, this is a well researched account of what America REALLY believes. everyone should read this book. the information presented is valid and reliable, the conclusions drawn are linear and realistic... it's so interesting. Compelling argument, although it does not address recent increases in partisanship among politicians and its possible repercussions. Read for class, a dull take on an over-talked subject. There is no left or right America, but, rather, a moderate one. Read this book to find out how media incorrectly portrays America as 'red' or 'blue' and how we are really 'purple,' or, in between. Important book, but he comes to questionable conclusions. America is split, 45/45. We'll see how the 10% vote in 2008.